novaPDF is a PDF creator for Windows that lets you create PDF files from any type of printable document. The software enables both individual users and businesses to easily create and share high-quality PDF documents. This helps to achieve an easy and more efficient collaboration. You can do all job with just a few clicks. For example; you can have your company’s reports, contracts, workflows, agreements, marketing plans, spreadsheets, forms, charts, emails or other printable documents converted in PDF format. 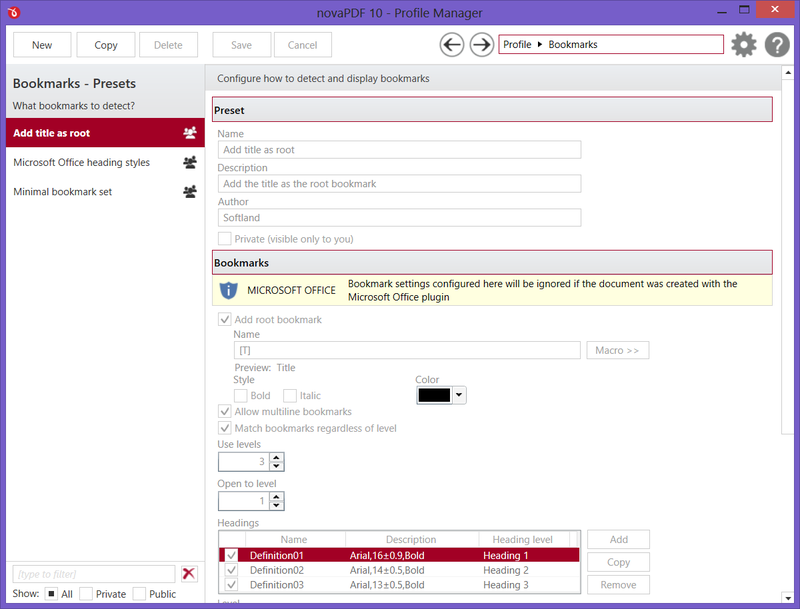 The resulted PDF files can be viewed on any computer with a PDF reader installed. The PDF printer driver has many features that allow you to modify the paper size, resolution, page orientation (portrait, landscape), Linearization, embed fonts, merge PDF files and lots more. You can define different private or public printing profiles. Each profile has its own printing to PDF settings. This is very useful specially if many users are using the same computer. Each user can have different printing preferences. Additionally, if you are the only user on this computer, you will have different settings for printing documents. novaPDF makes it easy to personalize your documents by setting the document information such as the title, subject, author, keywords. This is useful if you want to publish your PDF files on the Web. In addition, you can also create PDF/A compliant PDF files, thus is ideal for long-term archiving of documents. The program installs add-ins for Microsoft Office applications (Word, Excel, PowerPoint, Publisher, Visio) which helps to easily create PDF documents of your files. Also, novaPDF can automatically detect links in a document, detect the headings in the printed document and add bookmarks in the generated PDF files. You can password protect your PDF file to prevent the document from being viewed, printed, modified, copied or annotated. Additionally, if you have a digital signature you can sign your important PDF documents. The created PDF can be sent via email using the default email client, via Outlook or directly using the SMTP server. This PDF printer driver is compatible with 32/64-bit editions of these operating systems: Windows 10, 8/8.1, Windows 7/Vista and Windows Server 2016/2012/2008. It also requires the .NET framework (you'll be prompted during installation if it's not already installed). novaPDF can detect the headings in the document to be printed and add bookmarks in the generated PDF files. You have to define the text attributes for the document headings (font, size, style, color) and for the generated bookmarks. PDF merging refers to adding pages before the content of an existing file (inserting) or adding pages after the content of an existing PDF file (appending). You can also merge multiple documents from different sources in a single one, so this option is useful when you need to "stich" together documents from different sources. novaPDF supports TrueType, OpenType and Type1 fonts and can embed these (or only subsets) to ensure portability. You can also choose which fonts to be automatically embedded or never embedded. novaPDF can generate PDF files with embedded fonts which can be read and printed on any system without distributing your font separately, while maintaining the original intended design. Only the characters used will be embedded with small size of the resulting PDF. PDF documents overlay (could also be called PDF stitching), means that you can insert the content of a PDF file in another PDF document (either in front of the existing content or as the background for the existing one) and create a single PDF file containing the merged information. There are several templates included by default for easy setup (generic, invoice, letterhead). If your document includes any visible text that starts with "http://", "www", "mailto:", "ftp://" or "file://"; it can be converted to clickable active PDF links if you choose to do so. novaPDF can also verify if the file linked to exists during conversion to avoid broken links. Additional options allow opening the file in a new tab and customizing the underlining. This tool is very useful when you want to distribute a PDF file on the web and you want the links included in the original document to be accessible for users that receive the PDF file as clickable active links. novaPDF can create PDF files compliant with the PDF/A-1a and PDF/A-1b specification for RGB colorspace. PDF/A is a PDF file format used for long-term archiving of documents in electronic format that uses PDF Reference version 1.4. This allows you to control all features and tools of the program. 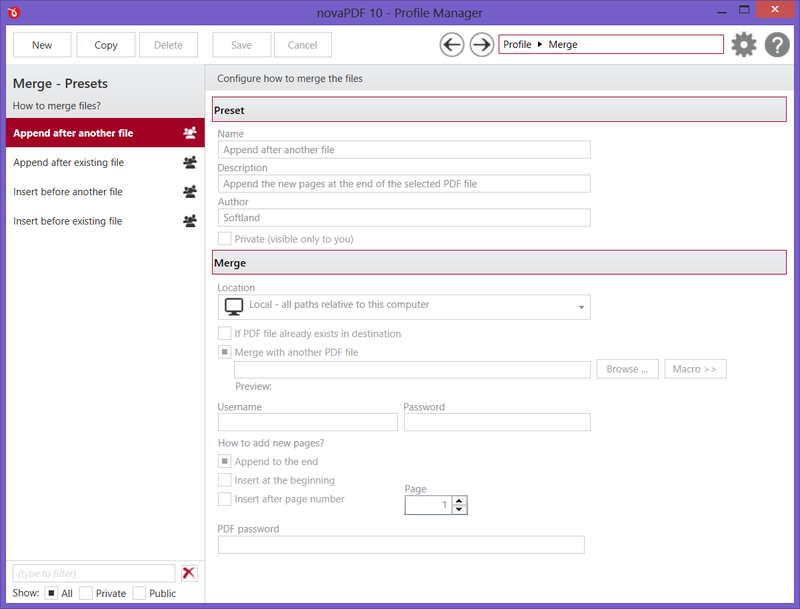 You can control novaPDF printers, assign profiles to for a selected printer, set the default active profile that client computers cannot override or allow them to modify a set of public profiles. In addition there are tools section which gives you quick access to print documents, manage printers, monitor printing progress, check for updates, change language and password protect the interface. Finally, you can manage the program the licenses and see information about the program. 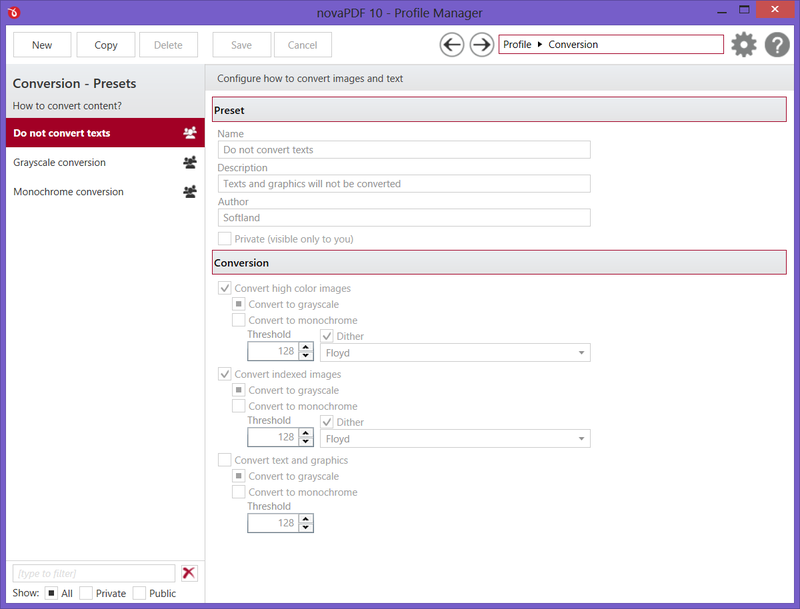 You can define private printing profiles for future use, each with its own profile settings. For example; you can specify the security, signatures, bookmarks and so on. This way you can switch between different printing profiles without having to modify the settings again for each document you are preparing. These profiles are only available on the computer where they were defined. 1. Reply here about novaPDF Professional favorite features in the new version 10. 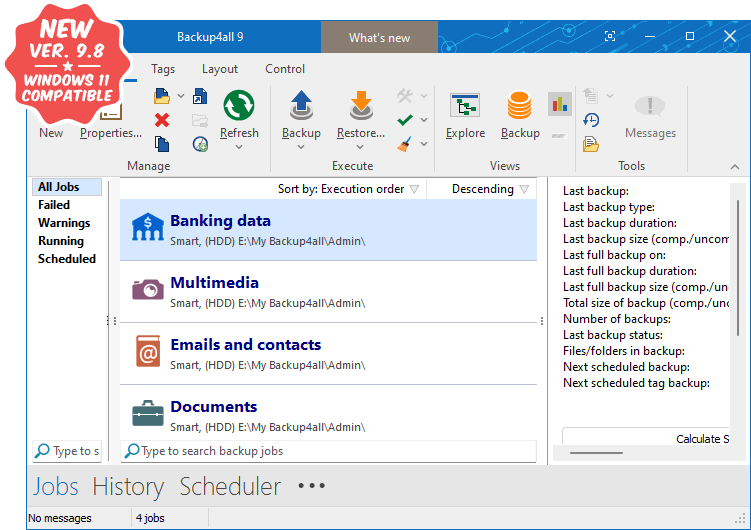 Backup4all is a backup software for Windows that protects your data from partial or total loss. It automates the backup process saving you time, compresses the data to save storage space (using standard zip format) and encrypts your backup to protect from unauthorized usage. Using Backup4all you can easily back up your data in the Cloud to Google Drive, Microsoft OneDrive, Dropbox, Amazon S3, Microsoft Azure, BOX, Hubic, Hidrive and more than 37 Amazon S3 Compatible online destinations. It can also back-up to any local or network drive, backup to FTP or SFTP, backup to DVD or CD, backup to Blu-ray or other removable media (such as USB HDD or flash drives). Backup4all is the best backup solution for desktop and laptop computers, for your business or personal use. Start protecting your important data now by downloading a free trial. Backup4all is compatible with the 32/64-bit editions of these operating systems: Windows 10, Windows 8.1/8, Windows 7, Vista, XP and Windows Server 2016/2012/2008/2003. Features I like are "All in One Printing and PDF Security". I will use it to secure my PDF files. The content I like about novaPDF is the ability to merge PDF into one and also we can use and setup FTP to manage PDF. Conversion of Image and Texts, and much more. I like Nova pdf pro's printer function and other functions like Merge PDF Files, New user tags feature etc. Backup4all supports back-up to any local or network drive, backup to FTP or SFTP, backup to DVD or CD, backup to Blu-ray or other removable media (such as USB HDD or flash drives). And also supports the feature of encrypting your backup to protect from unauthorized usage.